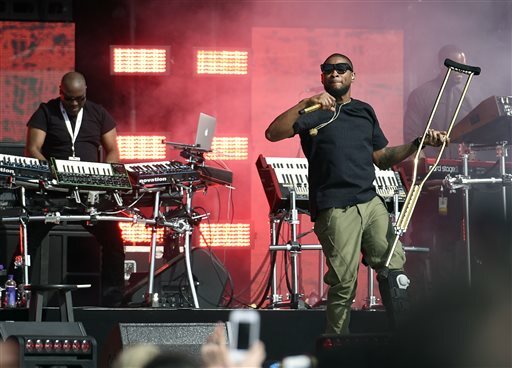 WASHINGTON (AP) — A daylong Earth Day concert had R&B star Usher dancing on crutches Saturday on the National Mall to rally thousands for political action to confront climate change and poverty. Usher, Mary J. Blige, Gwen Stefani, Common, Fall Out Boy and Train all performed during the free Global Citizen 2015 Earth Day rally hosted by will.i.am and Soledad O’Brien. The rally was a joint initiative of the Global Poverty Project and Earth Day Network. It coincides with meetings at the World Bank and International Monetary Fund. Usher joined the poverty project at the White House on Friday for a meeting with officials. “I felt really good that the issues we are addressing here are on the table,” he told The Associated Press. After his performance, Usher said his passion is expanding education to help end poverty. But the impacts of climate change also have severe impacts on the world’s poor, he said. For his part, will.i.am played host and said the huge turnout shows people are concerned. Backstage, Train frontman Patrick Monahan said he didn’t know much before about the environmental movement and the push to end extreme poverty. But now he wants to stay involved permanently. “It’s about all of us being aware but getting our hands dirty because it’s not going to be an easy thing,” Monahan said. Monahan said he’s been inspired by the charitable work of Coldplay’s Chris Martin and the Global Poverty Project, which has set a goal to end extreme poverty by 2030. Patrick Stump and Pete Wentz from Fall Out Boy played some of their hits and said they wanted to show their fans everyone has a responsibility to help. Wentz said issues around the environment and poverty will be as big as the citizens’ demand during the upcoming presidential campaign. The rally also touched on global health and development needs. The U.S. Agency for International Development announced from the stage that it will commit $126 million to rebuild West African health care systems that were broken by the Ebola outbreak. The U.S. government already has spent $1.4 billion on the crisis to support 10,000 humanitarian responders and to provide equipment, laboratories and training. While Earth Day is officially on April 22, the Saturday rally asked participants to commit to making environmentally friendly “acts of green.” Organizers also asked attendees to sign petitions for a U.N. conference on climate change planned for Paris in December. Tags: Common, Earth day, Fall Out Boy, Global Citizen 2015 Earth Day Rally, Gwen Stefani, Mary J. Blige, Soledad O'Brien, Usher, washington, Will.I.Am. Bookmark the permalink.